Care to see what Marvel has in store for Avengers 2: Age of Ultron? 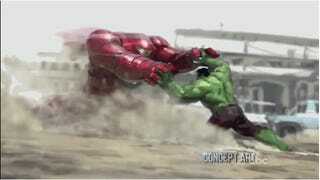 You know, besides this awesome concept art of Hulk fighting Iron Man in his Hulkbuster armor? Plus Ant-Man, Guardians of the Galaxy, and the first 11 minutes of Captain America: The Winter Soldier! Dear God, what has X-Men: Days of Future Past done to Quicksilver?